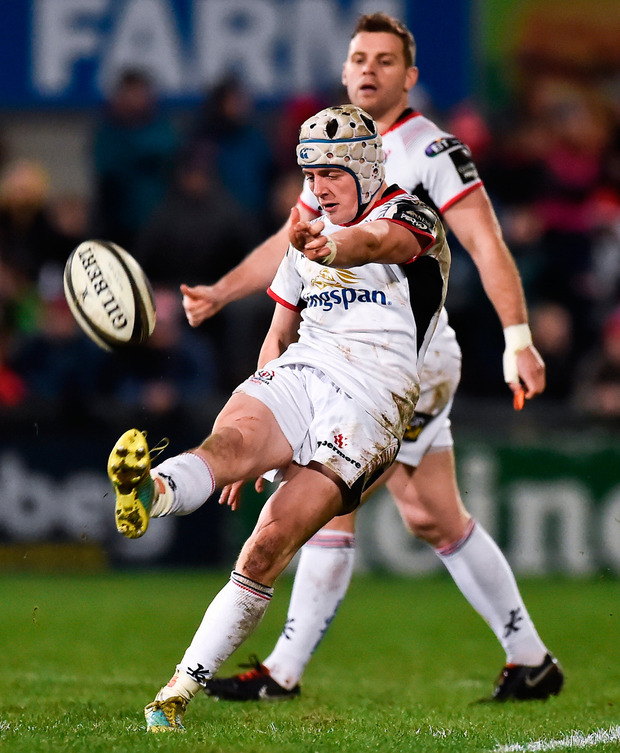 Just how many 'Get out of Jail' cards can Ulster play this season as a penalty try in the last stanza of the game saw them sneak a draw against a burgeoning Benetton side at the Kingspan Stadium last night. The recent heroic Champions Cup displays were already deemed history following a game that was certainly not a classic, but could have repercussions for Europe next season. The burgeoning Italians came with purpose and determination to put one over Ulster in Belfast where they hadn't won since 2011. They really deserved that honour, but after this stalemate they still keep Ulster in fifth spot in Conference B, two points adrift, as another European qualification sweat begins. 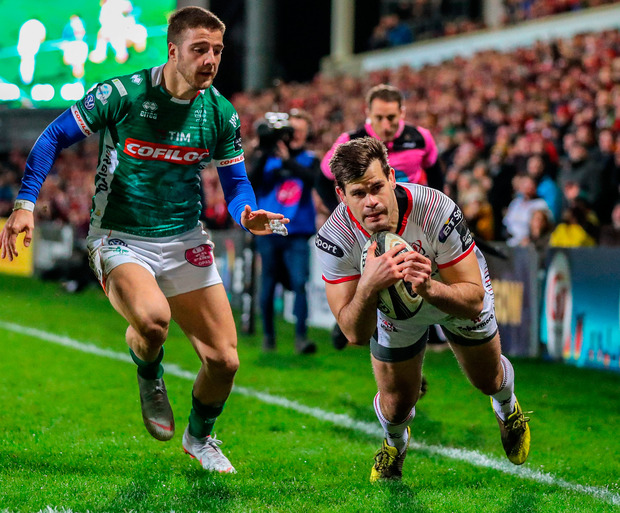 Ulster even had the boost of a try after only 49 seconds when Louis Ludik was put over in the corner by Stuart McCloskey. Unfortunately that was it for the rest of the half as the visitors duly dominated from then on. Benetton, who moved up into second place in the conference, waltzed into the lead in the 10th minute after man-of-the-match winger Ratuva Tavuyara made ground and from the quick ruck ball, lock Federico Ruzza crashed over. Fly-half Ian McKinley, who directed operations superbly, landed the touchline conversion and then landed a penalty near half-time. 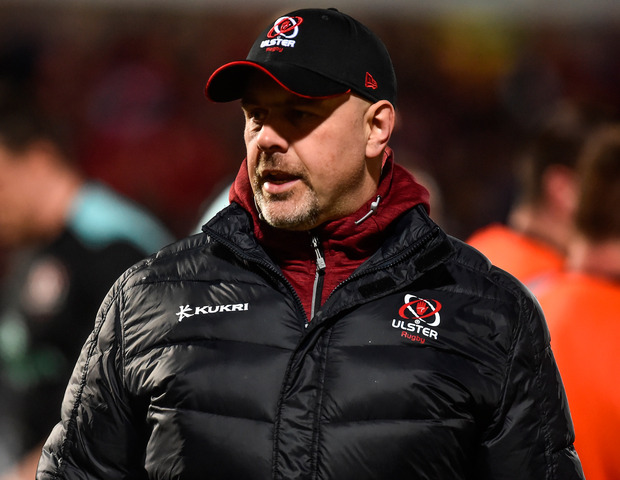 Ulster came out in the second half with fighting spirit and although Rob Herring crashed over from a lineout in the 45th minute, Benetton then completely dominated again. They scored another try through Tavuyara with McKinley converting. With the Italians leading 17-10 and playing well it looked all over as the clock went into the red. But one last thrust at a lineout from Ulster saw referee Nigel Owens award a penalty try. Ulster - M Lowry; R Baloucoune (Lyttle 55), J Hume, S McCloskey (Cave 40), L Ludik; B Burns, D Shanahan (Stewart 55); A Warwick, R Herring (Andrew 74), M Moore (O'Toole 56); A O'Connor (capt), K Treadwell (Ross 60); I Nagle, N Timoney, G Jones (Dalton 74). Benetton - L Sperandio; R Tavuyara, T Iannone (Brex 62), M Zanon, M Ioane; I McKinley (capt), D Duvenage (Gori 76); N Quaglio (Traore 50), H Faiva (Baravalee 55), M Riccioni (Ferrari 55); I Herbst (Fuser 56), F Ruzza; M Lazzaroni (Barbiini 50), M Lamaro, T Halafihi (Pettinelli 69). REF - Nigel Owens (WRU).